Assistant Engineer- Passed BE/B.Tech Degree in Mechanical/Electrical/Civil Engineering Discipline and 5 Year Experience in Similar Field. or Diploma in Mechanical/Electrical/Civil Engineering with 5 Year Experience in Similar Field. Office Assistant- Passed Graduation and Proficiency in Computers. Pvt Secretary- Passed Graduation and 7 min Dictation @120 wpm and Proficiency in Computers. Personal Assistant- Passed Graduation and 10 min Dictation @100 wpm. Asst Store Officer- Passed Graduation and PG Degree/Diploma in Materials Management. Medical Record Technician- Passed B.Sc Medical Records or 12th Science with Diploma in Medical Record Keeping and Proficiency in Computers and 35 wpm in English and 30 wpm in Hindi. Stenographer- Passed Intermediate and 10 min Dictation @80 wpm. Yoga Instructor- Passed Degree/Diploma in Yoga and 5 Year Experience. PACS Administrator- Passed BE/B.Tech/MCA and 2 Year Experience. MCWO- Passed Degree/Diploma in GNM/ANM 12th with Science Stream and Registered with MP Pharmacy Council. MRO- Passed Graduation in Science and 5 Year Experience. 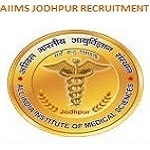 Eligible Candidates can Submit AIIMS Jodhpur Non Faculty Post 2019 Online Application at the Official Website of AIIMS Jodhpur Latest by 23rd April 2019. Applicants First Open AIIMS Jodhpur Official Website. Open Non Faculty Group B, C Post Recruitment Advertisement Link. Now Click on Apply Now Link. Now Apply for Medical Officer, Paramedical Officer Link through MP Online.